Google Docs online suite at docs.google.com rule the online world, while Microsoft Office software rules the offline world for users to able to create word, excel, powerpoint documents. 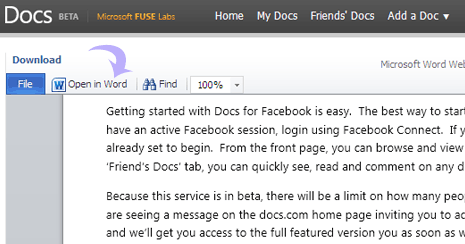 Microsoft has launched online Office suite at docs.com website with Facebook integration. It says documents for Facebook but this for sure is more than just for Facebook users (in future, hopefully!). 1. Goto Docs website Sign-in using Facebook account login (as of now only for Facebook users). 2. Goto ‘Add a Doc’ to upload document from your computer or create new Word, PowerPoint, Excel document. 3. Microsoft Office like interface to create and edit document should appear. As of now, service is invite only – got to wait before using the actual thing. 4. There are few test documents on the website which you can open and preview. As expected, preview window has a direct button to open online document in Microsoft Office software installed on your computer.